Students Sew for Good Cause. 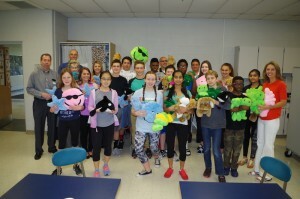 DRI & DCA Provide Kits - Direct Recruiters Inc.
Amy Charney, Home Economics teacher at Solon Middle School and her class did something really special for kids in area hospitals receiving treatments. They sewed stuffed animals with sewing kits donated by Solon firms, Direct Recruiters, Inc. and Direct Consulting Associates, and distributed by the Leprechaun Foundation, an organization devoted to helping these children and their families. Kudos to Mrs. Charney and her class! Great job!